In the bulb plunge bed, a sand bed at the front of my greenhouse, a never ending display of tiny pots ( and some not so tiny pots) gets set weekly, it's where I like to show whatever is in bloom, and it functions as sort of a display bed, if only for me, and the occasional visitor. By spring, the bed gets less and less interesting, as does the entire greenhouse for that manner, as more interesting events are happening outside. The final reset of the display bed happens around May, just after our Primrose party, when the last of the tiny collector bulbs that require protection, bloom marking the final transitional period for southern hemispheric bulbs before the begin the dormancy as the temperatures rise, and the soil in their pots dries out. A closeup of Dipcadi serotinus shows a little slug slime, but they are not eating the tissues on this plant, which leads me to believe that either it is slightly toxic, or just doesn't appeal to them. 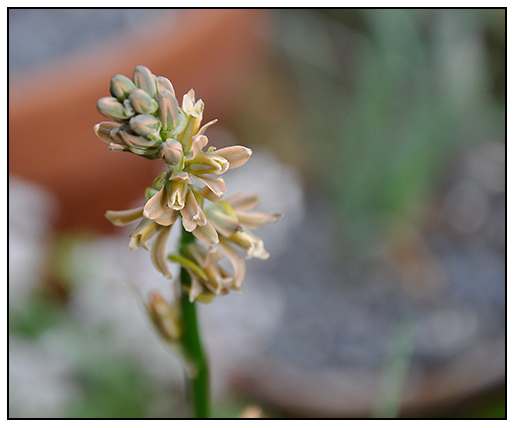 The last of the Lachenalia are starting to bloom. This time of year always surprises me when it comes to Lachenalia, for these seed-raised pots from wild collected sources in South Africa often provide some surprised such as this pot of very beautiful Lachenalia unicolor forma. alba, a species rarely seen in an already obscure genus found in few gardens outside of the serious collectors. 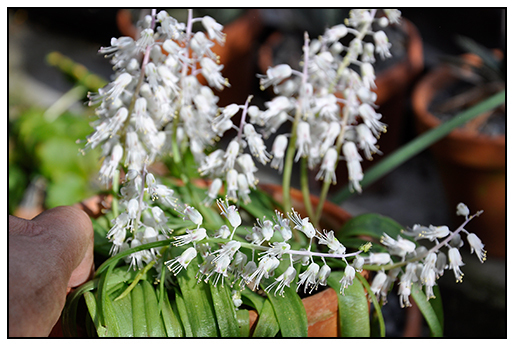 Lachenalia latimerae is quite rare, or at least, rarely grown as I have never found bulbs available anywhere, and when one Google's this species, only this blog appears besides the Pacific Bulb Society site. 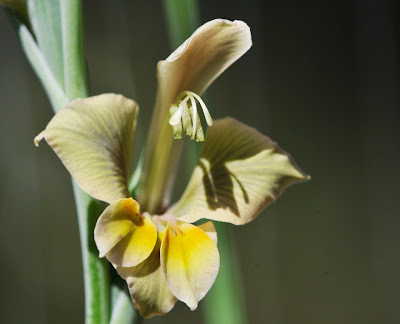 Easy from seed, the only challenge here is finding the seed, and as there generally is only one or two sources in South Africa, this plant shall remain one only found in private collections, and perhaps, a large botanic garden such as Kew. I think it is lovely, a late bloomer in more ways than one, this pot is almost ten years old, and needs a refresh. I've been lazy in fertilizing and in winter care, literally not watering this plant as it sat on a shelf in the greenhouse hidden behind some Nerine sarniensis, until I found it last week, when I watered it for the first time. It is still blooming, though weakly. Lachenalia 'lost label' It said ' L. uniflora' which it is not. Another reason why I need to start placing vinyl labels inside the pot, too. A new practice I have started this year. I love plants that I have never seen before, and I assume that this might be a new genus for many of you, too. 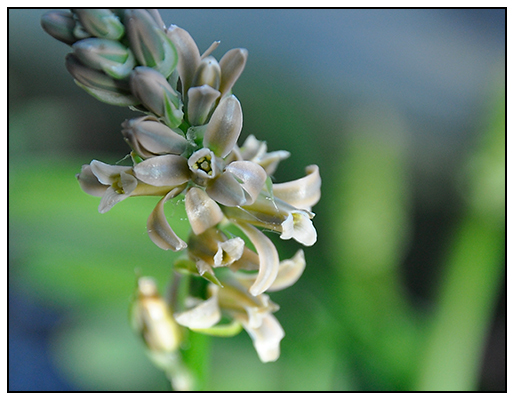 Dipcadi is a tiny genus within the family Hyacinthaceae, the Hyacinth family, and rarely seen bulb in most collections. 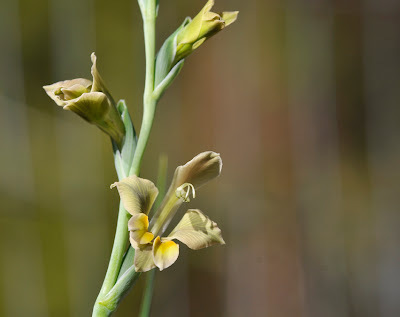 It grows in southwestern Europe and Sub-Saharan Africa into India, and to those of us familiar with bulbs like Albuca and Dipcadi, you may see the similarity. Botanists, or to be more correct, taxonomists are still evaluating whether this is a genus which needs to be re-classified but for now, it sits within Hyacinthaceae. 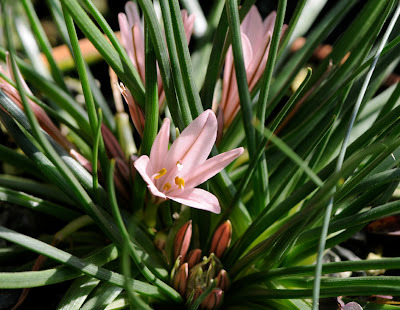 For the rest of us, it makes a charming bulb plant for greenhouse culture, or if you live in warmer, Mediterranean climates, a special bulb plant for outdoors. It's color is unique, a blend of tan and olive, and it appears to have no fragrance. You can try one by ordering a bulb or two from Paul Christian in the UK when they offer it ( they currently do not have it listed). It reportedly sets copious amounts of seed, but with a single plant, I am not certain that I will have viable seed set. Regardless, I shall bring out the paintbrush and plant bumble bee ( or beetle? Hummingbird?) and get going. Narcissus triandrus ssp. 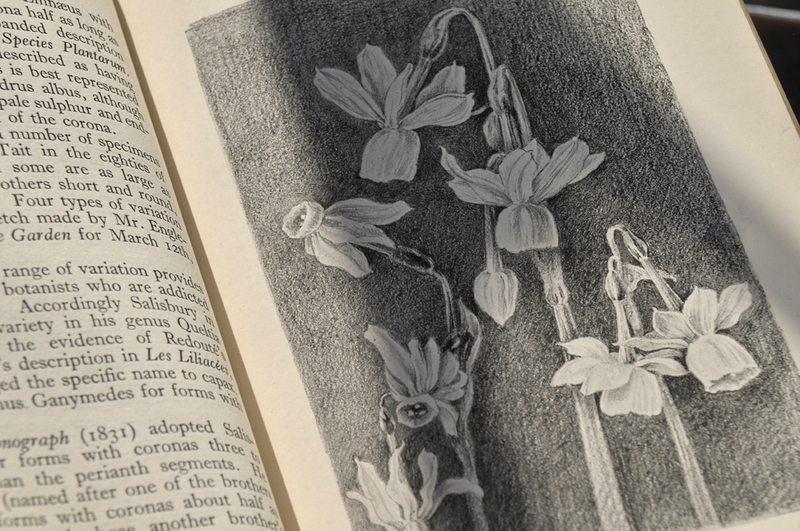 triandrus 'alba' , a challenging wild form of Narcissus, as shown in a book by Alex Gray, MINIATURE DAFFODILS. I've tried, and had some success with this beautiful species. It's worth seeking out. 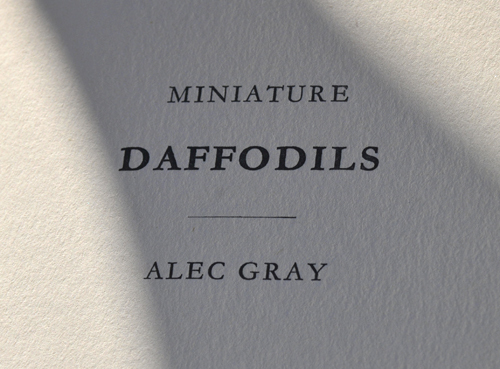 I went through a miniature narcissus phase a few years back, after reading the book MINIATURE DAFFODILS (1955) by Alec Grey and the book THE NARCISSUS by E.A. Bowles ( 1934). 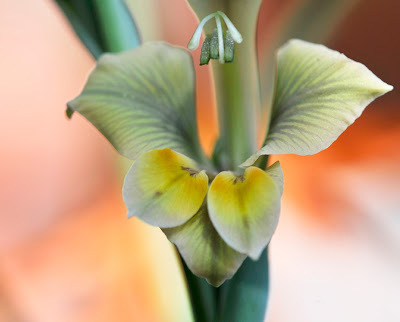 There are many species and named forms of miniature narcissus, but like many plant, or specifically bulb enthusiasts, or, even to be more precise- many narcissus collectors- the most coveted bulbs are those which are most difficult to grow. A challenge, always amps up the desire. And so it is with the true species form of a daffodil we rarely see in northern gardens, Narcissus triandrus ssp. triandrus. As a recap, daffodils are organized into 13 groups that are called divisions. 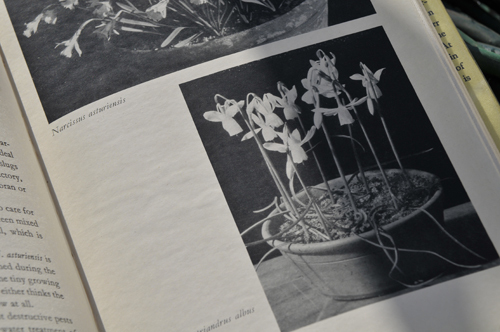 When you buy daffodils or narcissus ( the same thing) from catalogs that follow such rules, you will see them organised as such, which is the proper thing to do. A daffodil society show, will also show their flowers separated into these Divisions. They are frequently listed, as DIV. I, DIV.III, etc. Narcissus triandrus are DIV. V, TRIANDRUS, and these include some common named hybrids like "Thalia". a large, orchid shaped white daffodil. But, this pot below, would be most properly placed in DIV 10 SPECIES and their varients, which simply ( or not so simply!) means that this is one of the wild forms of the genus Narcissus, and in this case, Narcissus triandrus, the pure species. Best of all, which is difficult for me to remain humble about, is that for whatever reason, I've had luck growing this species, and these seed raised forms below are proof that success can be had, even with little care. Most of these collector books list this pure species as "difficult", and "growable- for a few years, then it will decline". Thankfully, mine have set seed, which I have sown back into the same pot. Now these are blooming, and I am quite pleased. Narcissus triandrus blooming in a small pot, wintered over in a cold glass house. Much smaller than the hybrid 'triandrus' types sold in Dutch catalogs, these small species are not only difficult to grow, they are hard to find in any catalog. 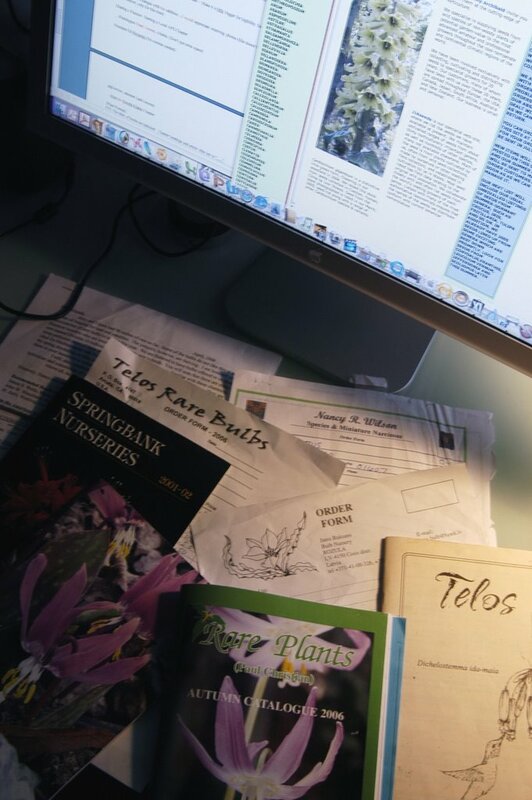 I get mine from NARGS seed exchange lists, or from a handful of on-line sources such as Nancy Wilson's site for miniature narcissus, or from Paul Christian's site. Why the double pot? 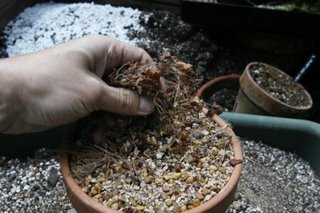 Not necessary, but it keeps the bulbs more protected from frost, since I keep this pot near the icy glass in the winter, and since this insists of fast drainage, the outer ring is gravel, and the inner pot a fast-draining mix. 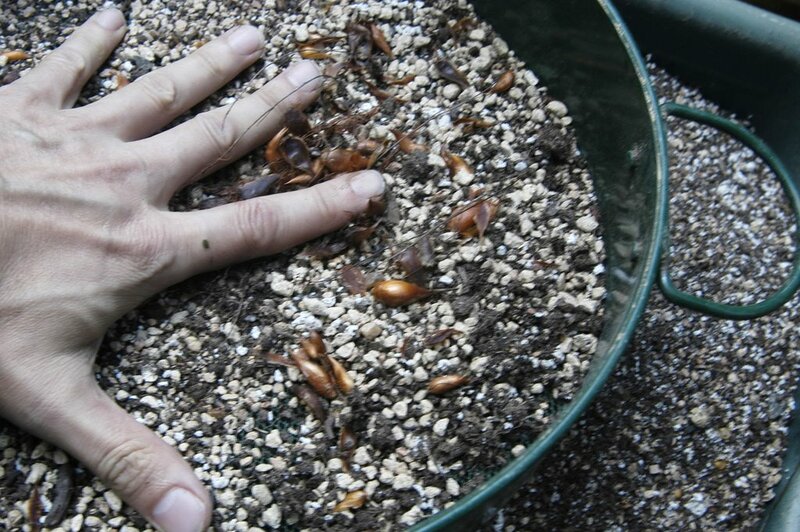 Any more soil, and it will hold more water, which raises the risk of bulb rot. Native to the high mountains of Spain, Portugal and south western France, this species is still worth growing if you can provide perfect drainage and a hot, dry summer. Other miniature narcissus are slightly less fussy, and can be grown outdoors, as seen here in my raised alpine bed. "Wee Be" on the left, looks like a large narcissus, but this plant is only 4 inches tall, and the flowers are the same size as a nickle. N. cyclamineus in the back. 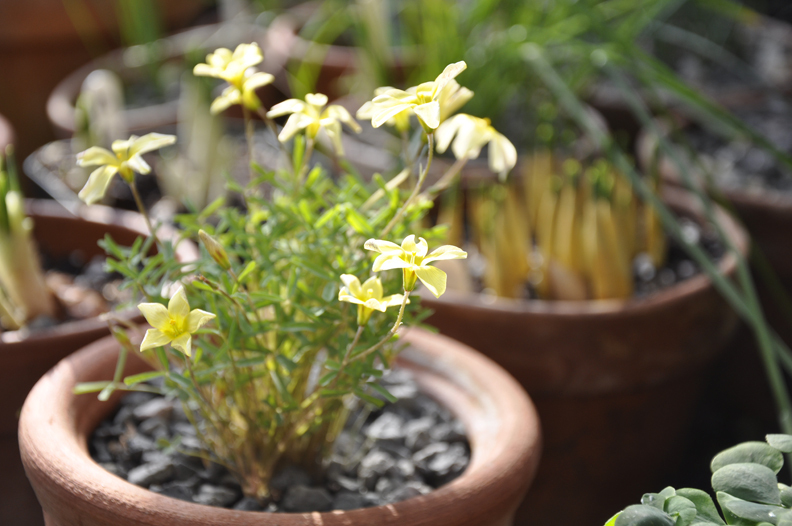 As the snow falls outside, under the protection of glass, tiny bulbous oxalis species from the western Cape, continue to bloom in their pots. 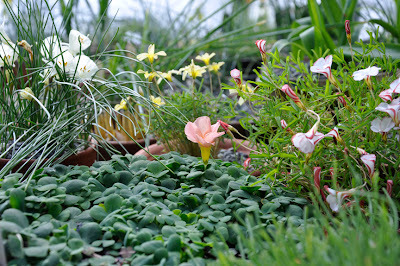 In the center, the large pale pink blossom of Oxalis zeekoevleyensis, which grows in wetter places in its native habitat, grows in a pot which is set in a pan of rainwater. I am always surprised at how much water some of the winter-blooming bulbous Oxalis can take, even standing water. YOU ALL SAW THE PHOTO LAST WEEK OF MY CLIVIA'MOONDROPS' X, BUT I WANTED TO SHARE HOW IT CHANGES COLOR AS THE BLOSSOMS AGE. I thought I had lost it, my large pot of Scadoxus multiflorus ssp. kathernae which I've kept in an increasingly larger pot, every year hopping to get a large specimen. When our greenhouse froze last December, I thought I had lost it. Well, actually, I did lose it. Shoved under a bench most likely around November, when I brought the plant indoors for the winter, it remained dry, on its side, and dormant until last week when I found it while cleaning the greenhouse. It's looked better in past years, but it still had a flower bud, which bloomed this week and the plant resumes it's growth for what's left for the summer. 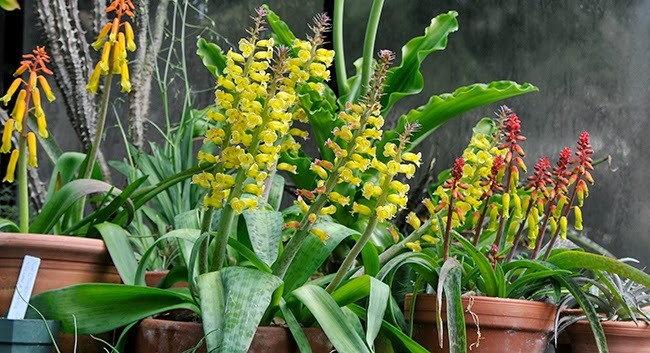 An easily grown plant, it can be fussy when trying to coax a bloom from a house plant specimen. 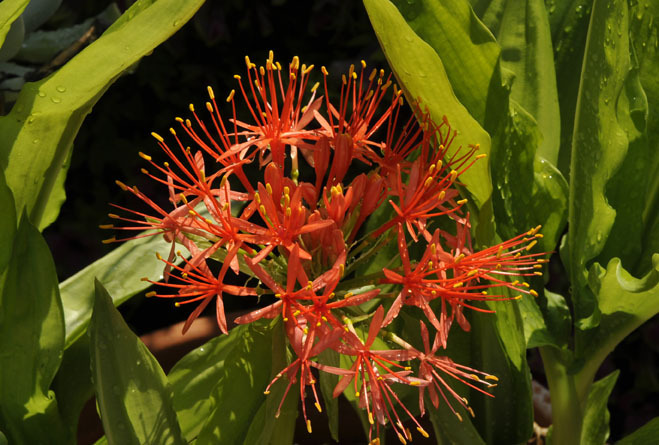 Best advive is: Allow your Scadoxus multiflorus to dry off in the winter months, giving it just enough water to keep the bulbous shoots green and firm. 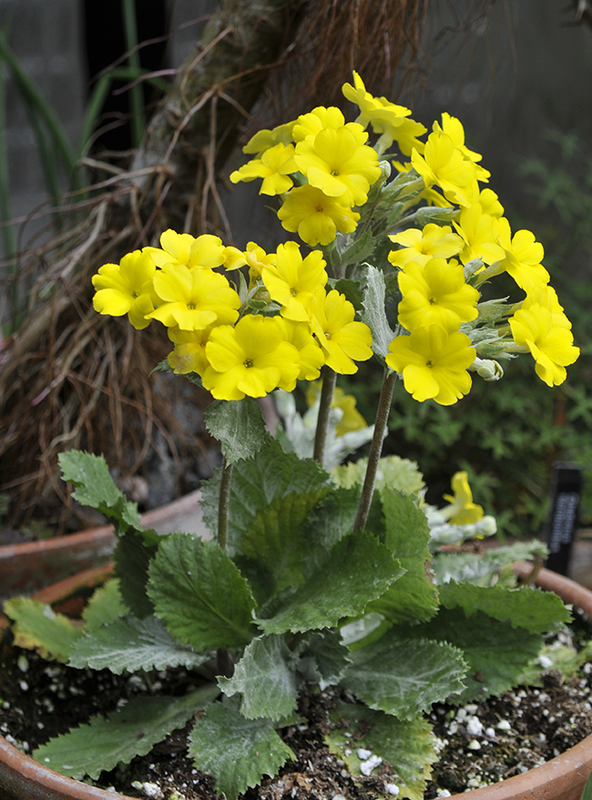 When spring arrives, increase watering, and if you can, bring the plant outdoors where it should bloom. Another one of those borderline 'bulb' plants which sometimes never really go dormant, I too never had flowers until I had the greenhouse to winter them over in. 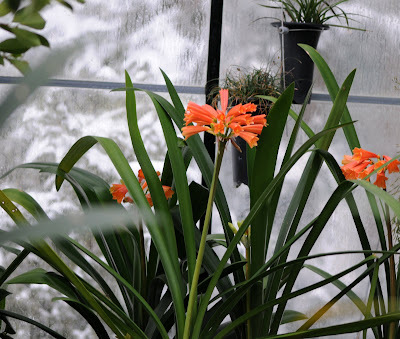 So the situation is similar to my Clivia issue, before greenhouse, few flowers, after greenhouse, all the clivia bloom exactly at the same time. So I continue to believe that the triggers are a special combinations of daylength, temperature and perhaps moisture, but to be honest, my Clivia and Scadoxus get some water year round, since they do spend dormant time under the mesh greenhouse benches, where plants get watered with the hose above them, year round. 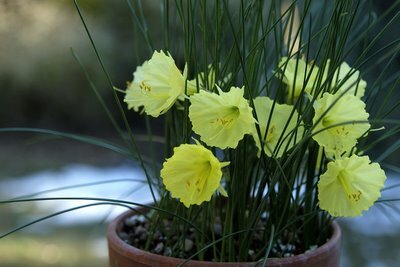 This small, winter blooming bulb is the perfect candidate for a potted alpine bulb collection for an alpine house, or a plunge bed. Somewhat hard to come by, this plant comes from Morocco and it produces these pure cotton candy pink flowers which grow on a very short stem. I have had this plant for three years and it is starting to create a nice, multi-crowned plant. The foliage is lax, and somewhat protrate, if not alpinesque in appearance, although, not actually an alpine. This is also not technically a bulb, but rally only rarely available from those few retailers who sell extraordinarily rare or unusual bulbs,suc as Paul Christian in London. This is more or an geophyte with strange, fleshy storage roots, which allow the plant to go dormant during the hot, dry, moroccan summer. 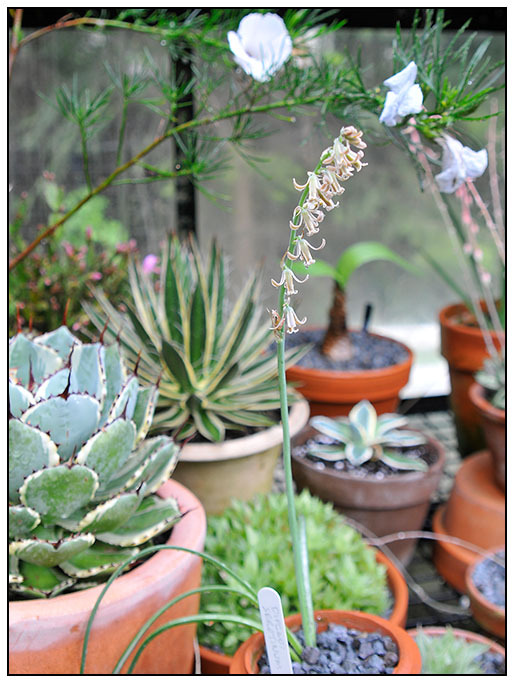 Not unline an Eremurus, actually, but much smaller. 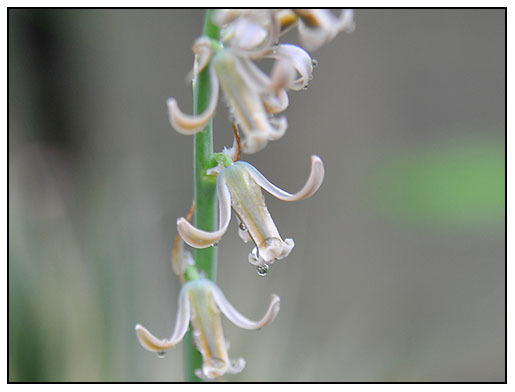 The Asphodelus flowers open on sunny days in the winter, around late January or February, and given the high production of bud, we will be enjoying it's pink lily-like flower until true spring. 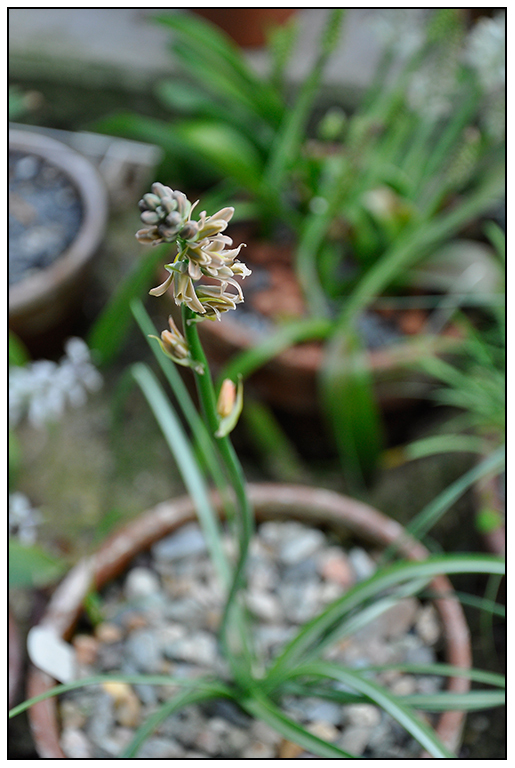 This year I was fortunate to acquire three names forms of Ornithogalum fimbriatum, and this is the first to bloom. Unlike the more Wal-Mart-y Ornithogalums, this baby is less trailer park, and more Kew. I will get a better shot on a sunny day, when the flowers all open like white waterlillies, but on a snowy day like today, one can also enjoy the apple green outside markings on the petals. 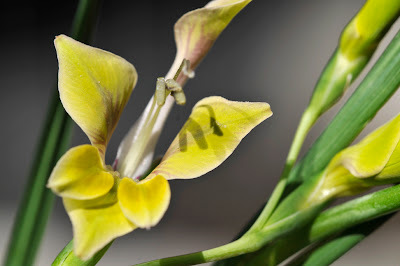 All kidding aside, I am smitten with all of the Ornithogalum speces, trashy or not. But these 'fimbriated' forms, ( see the serated outlines on the leaf?) are terrific alpine subjects for a collection in a cold greenhouse. I grabed a quick shot of some of the interspecific Clivia which are now blooming. I leave for Japan this Wednesday, and these remind me of the seeds I brought back a few years ago, since, these are them. First time blooming, from Mr. Nakamura's Breeding Plantation. 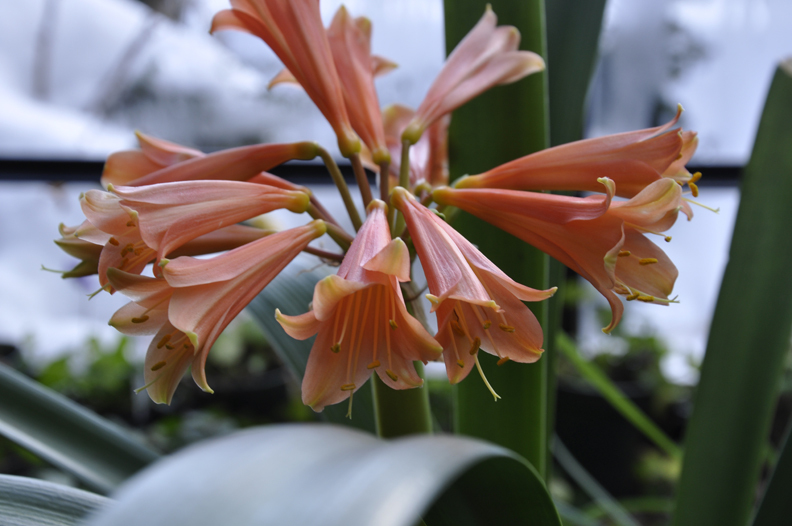 Mr Nakamura and Shige are great hosts, when I visited, and the hundreds of Clivia seeds which we brought back are all starting to bloom, I am so excited. Although, I may miss many of them due to this trip back.Perhaps a few will make it into the New England Spring Flower Show this year, if they hold off. 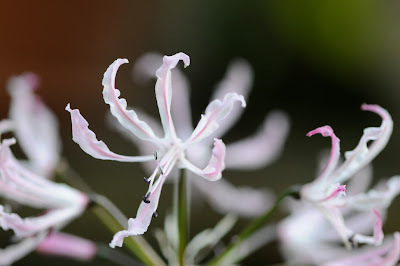 Some Nerine species are still blooming, and this dainty species with undulating petals is proof of the name. ( syn. N. alta). It is much more graceful than it's showier cousins, the N. bowdenii and N. sarniensis that bloomed in the autumn. 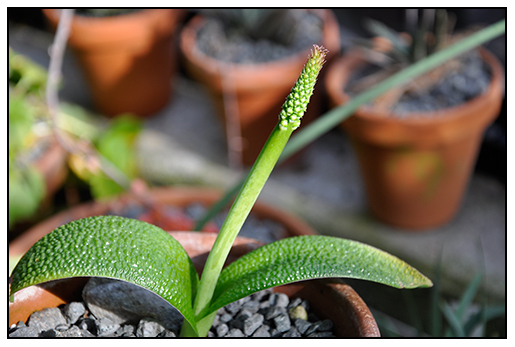 Of course, there are a few much showier relatives that I hope will bloom soon, but maybe next year. Margaret takes a nap, recovering from her throat surgery last week at Tufts University Hospital. Poor Muggles, has a serious Larynx problem. 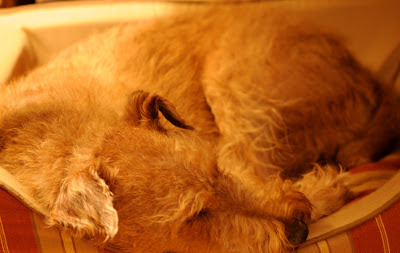 But, for now, the laser surgery went well, and at least she can breath a little easier, at least for a while, but we still can' t leave her alone. 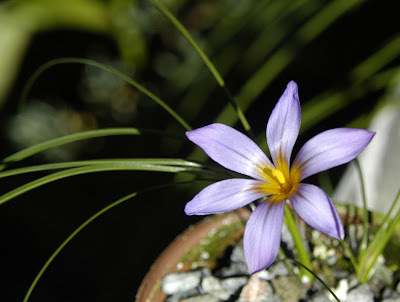 The Genus Romulea is relatively unknown by most, since one rarely finds the corms available in the trade, and thus, they must be grown grown from seed, an easier venture than you may imagine. Seed is often found in plant society seed exchanges, and most people skip over these, opting for the trendier Arisaema and Paris. 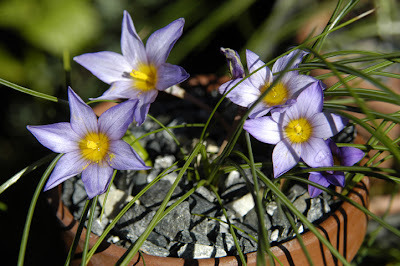 These tender, crocus-like corms are grow mainly in South African, but also in the Medeterranian area. This is a good hint, that tells us that they can be grown outdoors in North America in California, and in the UK, or anywhere where winter moisture occurs with summer dryness, and the ground doesn't freeze. The three species shown here are quite similar, and I am glad they they bloomed together so that I can see thier differences, as well as thier similarities. I am also glad that it was sunny this weekend, for in the cold greenhouse, they only open when the sun is brilliant, and the air becomes warm. Poor bees, they can't reach them, so the pollen falls on the petals, at least ensuring that I get seed again, to grow more corms, which I need, since Romulea need a crowded pot to give a decent display. 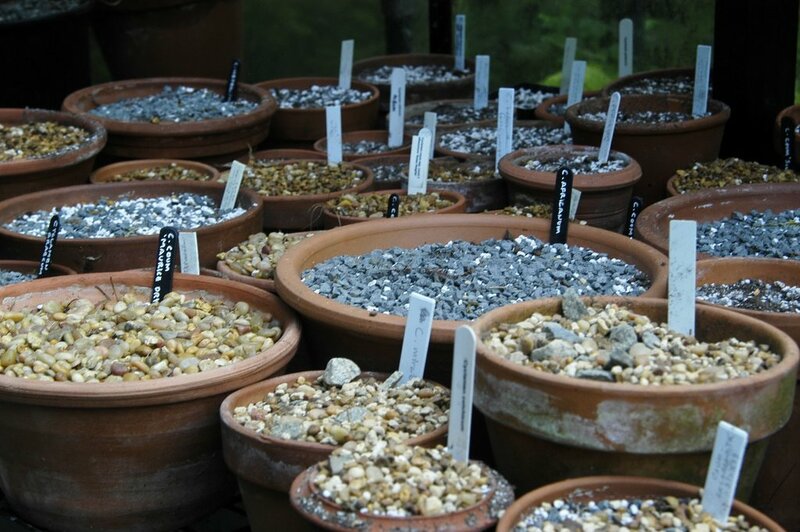 My collection was a gift from a local plant collector, he purchased the seed from plant society seed exchanges, either the Scottish Rock Garden Society, the Alpine Garden Society or NARGS, but he told me that he decided to order one of each packet, to see if they would grow. We split the corms a few years ago, and we each have about a dozen species. 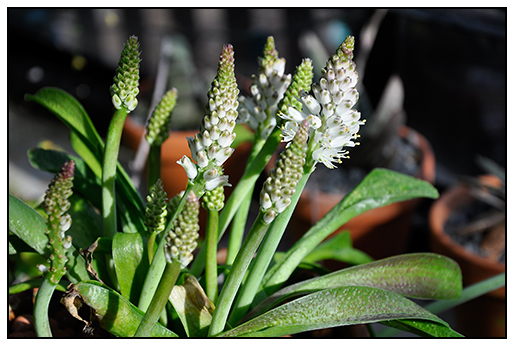 A few bloomed last year, but this year, the pots are becoming more full, and February is starting to become Romulea season, as well as Lachenalia season and Narcissus season in the Greenhouse. Spring doesn't seem that far away, when one can spend a Saturday in the hot sun of an 80 degree greenhouse, even though the temperatures outside near zero F. the sun is stronger, and one can feel it as well as the plants. One of the greatest benefits of having a greenhouse in New England, I have found, is that by February, the hot bright sun, combined with the fact that one can be elbows deep in soil, and amid fragrant blossoms while the snow still sits on the ground, makes winter so much more bearable. 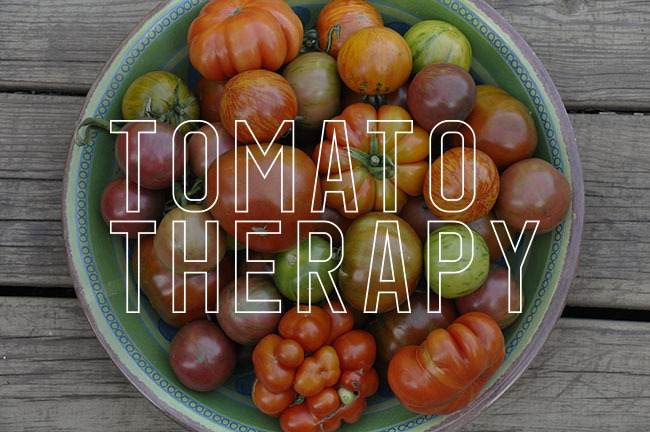 At the end of the day, your pants are wet from the hose dripping water on them, your boots are muddy, ytour face is red from the heat of the sun, and your nails are filled with soil - summer may be four months away, but teh gardening season has certainly turned a corner. 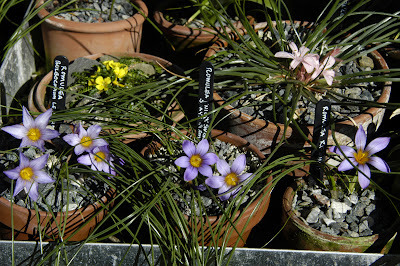 A trio of similar looking Romulea show how taxonomists often find slight similarities when keying out species. Finally, I am home after traveling for work all month. Hopefully, November will be a little less hectic, although, I do have a book due to the publisher, and new projects are work. 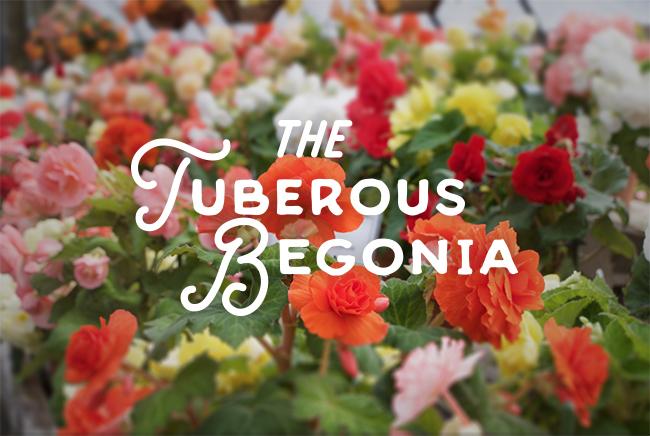 Upon arriving home, I was shocked at what was in bloom in the greenhouse. So over the next few days, I will be updating daily to catch everyone up. There are so many things happening under the glass, that it will take many postings to catch up. 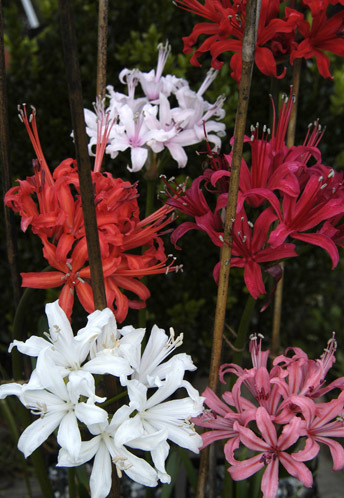 Here is a shot of a group of Nerine sarniensis, which I took while home for one day last week. Many of these are now past, but many more have come out. Besides blooming, other greenhouse drama's have occured. The gas heater exploded, so that had to be fixed last week. Well, not exploded, but flames shot out and burned wires, and the bottom of the heater blew off. I hate those things anyway. Even though the glass was all repaired two weeks ago, three large panes 30 inches each slid off last night and smashed into a million shards into the raised rock bed, Weeding will be fun next year! 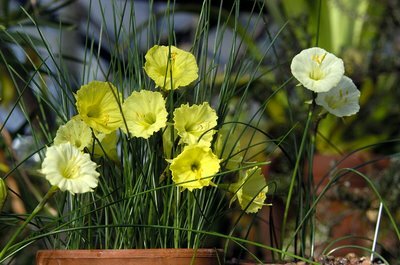 August is the time to plant these tiny precious and rarely seen Narcissus species. I grow many of the bulbocodium types of Hoop Daffodils along with the other summer dormant bulbs in the greenhouse, they are the highlight of the late autumn and winter greenhouse with a bloom period that begins in October and ends in April with the latest of the species. 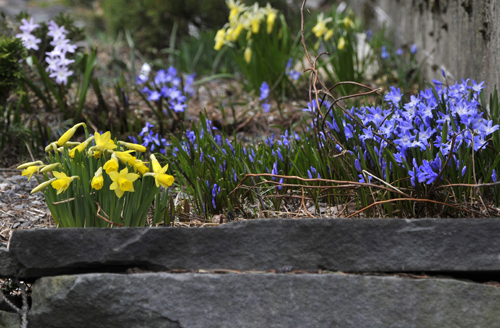 By then, the outdoor narcissus take over and one can have narcissus in bloom for 8 months straight. 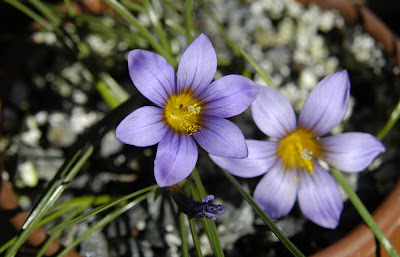 Quite rare, in the sense that you will really have to cleaver on-line to find these jems, the lesser of the miniature Narcissus are well known amongst alpine plant growers in England, and to rock gardeners in North America, who have a greenhouse or who live in a medeterranian climate. They demand the conditions that match thier native lands, from Spain and Portugal to Morrocco and Turkey - basically, once again, dry in the summer dormancy, and frost free and moist in fast draining soil in the winter. This year I am attempting to grow more smaller narcissus, especially the species and hybrids in the sections of N. cyclamineus and N. triandrus. 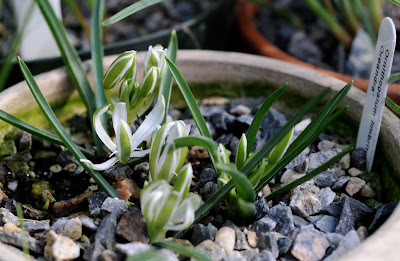 Both are and have been treasured as alpine house classics throught the nineteenth and early twentieth century by bulb collectors and alpine growers around the world. They remain absent in the trade, and can only be found a a very few of the best daffodil growers. both in containers and in he rock garden. A little pricy, or even alot pricy with some bulbs selling between $20 -$45.00 US, it takes an investment to fill a pot of twenty bulbs. 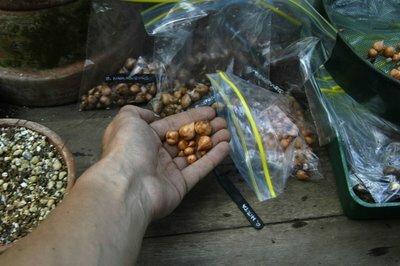 I am going to start with 1-3 bulbs each, and see where that takes me. I will still be eating ramen noodles for a few weeks, surely! 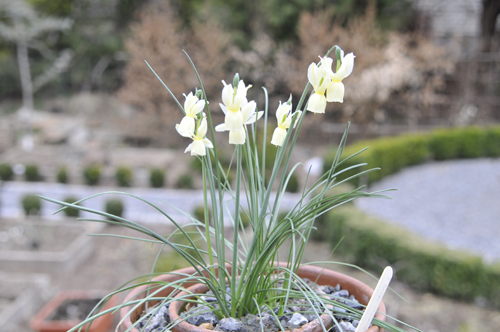 A pot of Narcissus romiuxi in bloom last December. I've become daffy about mini daffodils. In the past two weeks, I've joined the American daffodil Society, ordered most every book on the subject from Alibris.com (a great site for out of print books from all over the world) and I am smack in the middle of ordering mini daff's from the few, not even handful, of mail order nursuries who carry them like Nancy Wilson in the U.S and Paul Christian in the UK. Now, I should be more clear. Of course there are many other bulb nurseries, like Brent and Becky's bulbs, and others, many of which carry a selection of true miniature narcissus. 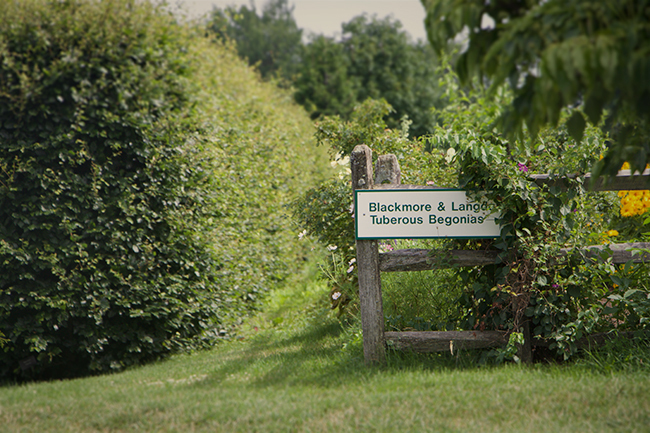 The named varieties that you will find in most of the more respected catalogs are all the same. A few like the variety Xit and Clare, are harder to find as are the species N. rupicula and N. waterii, but a couple catalogs still carry them from time to time. 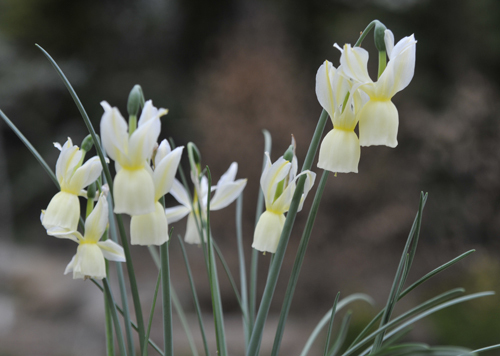 Don't let this discourage you, al narcissus are great, and all of the miniatures are super and precious in the garden. 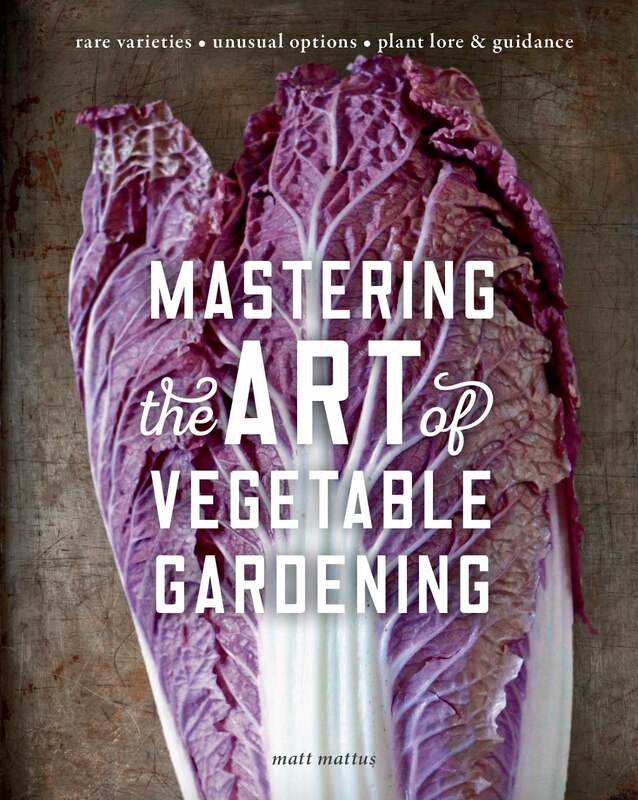 Remember, I'm a plant geek, and to those of you who are also plant geeks, we tend to look deeper. Way down to, say, what woudl the rarest narcissis be? What would be considered the most unusual. Many of you may be like me, and atend local meetings and specialty plant clubs during hte winter, all which have little contests where members bring treasures from thier greenhouses to compete against each other. Some of us grow a few pots to enter in the larger flower shows like the New England Flower Show or the Philadelphia Flower Show. So we look for the real unusual, it't what gives us goose bumps, to see a precious unusual species that is often not seen. Plain yellow daff's are stil nice. we are just numb when we view them. What I am particularly interested in, are very particular types of narcissus, that require special conditions, not difficultu really, but ones that must be grown in an alpine house throughout our cold, New England winter. Requiring bright sunlight, and cool temperatures along with bouyant air and fresh water. Granted, collecting these particular species is this is a subculture, if you will, of either Narcissiphiles or Alpinists, or maybe even both combined. Let me put it this way, it's not going to get me a date! These bulbs really can only be grown by those who either live in a more medeteranean climate like California, or who have an alpine house in the north. Since they require similar conditions as many of the South African bulbs that I grow, they are a perfect fit. 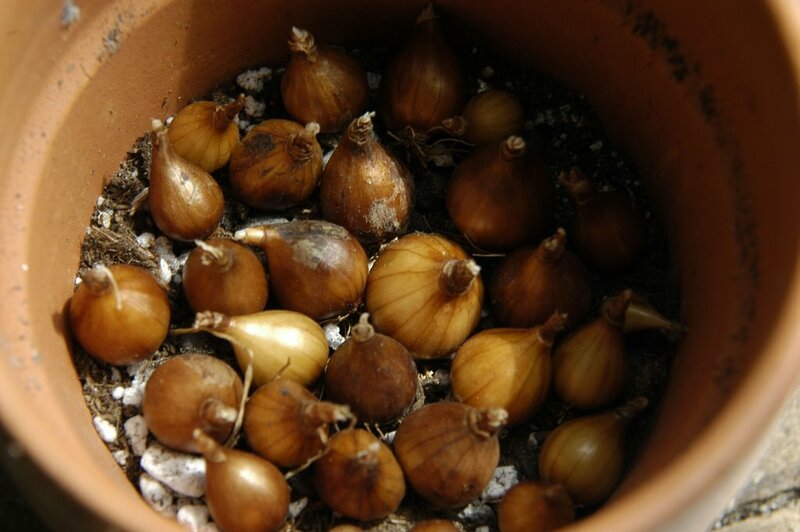 The best results come from crowded pots, the bulbs seem to like touching each other. 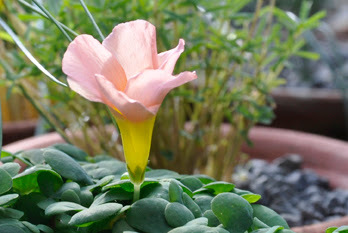 The rarer and slow growing Bulbous Oxalis species perform best when repotted in the summer while they are dormant. 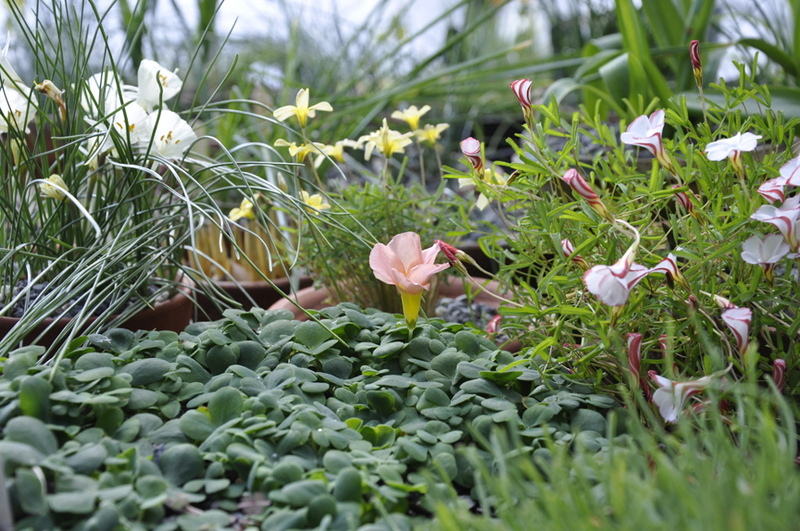 The highly collectable bulbous Oxalis species that hail from the winter growing areas of South Africa and South America are a far cry from the weedy pest that plague our gardens and greenhouses. This is an enourmous genus and are truly sought after by plant collectors. Once you try a few of these winter growing and summer dormant species, you will be hooked and then the collecting begins. And that is not an easy thing to do, since the finest bulbous Oxalis species are only available suring a few weeks of the summer and only from a handful of catalogs, if that. My greatest mid-summer chore is repotting all of the bulbs which are now dormant in the summer. A great many of my collection does come from the southern hemisphere, and most of these transcend into a deep, summer rest, with some wanting to bake high on the sunner shelves of the greenhouse where they can remain bone dry, and others just want to get splashed occaisionally to keep their cell wall turgid, but not enough to ever signal that the fall rains have arrived. 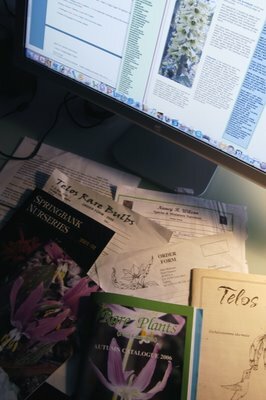 Late July is when I start repotting most of these winter bloomers, and this incudes collections of Cyclamen species, Narcissus from the Mediterranean and the bulbocodium type like N. romieuxii, N. cantabricus et al, Lachenalia, Romulea, and of course, the Bulbous Oxallis species, the jewels of the collection. 1. Carefully Remove dead foliage and topdressing. 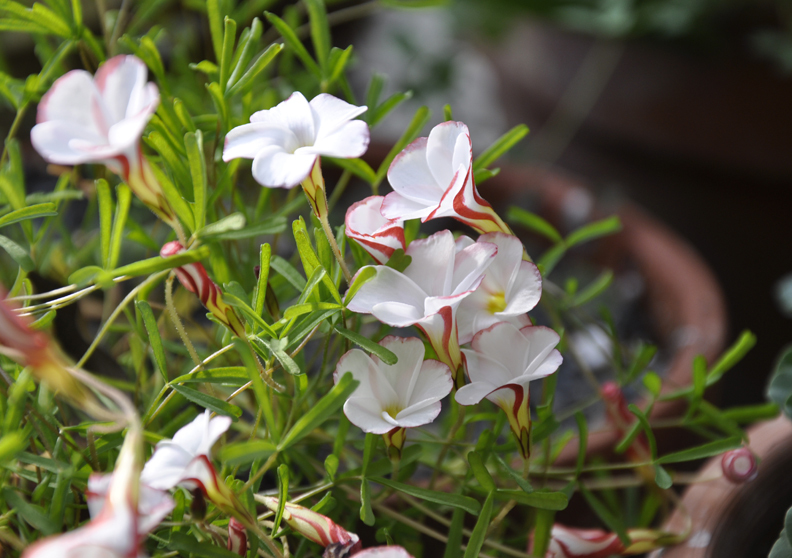 Once Oxalis stop growth and whiter around May or June, allow the pots to go bone dry until you are ready to repot.Carefully remove old foliage and discard, being careful that no bulbs are attached to stems. 2. Dump compost carefully into sieve. 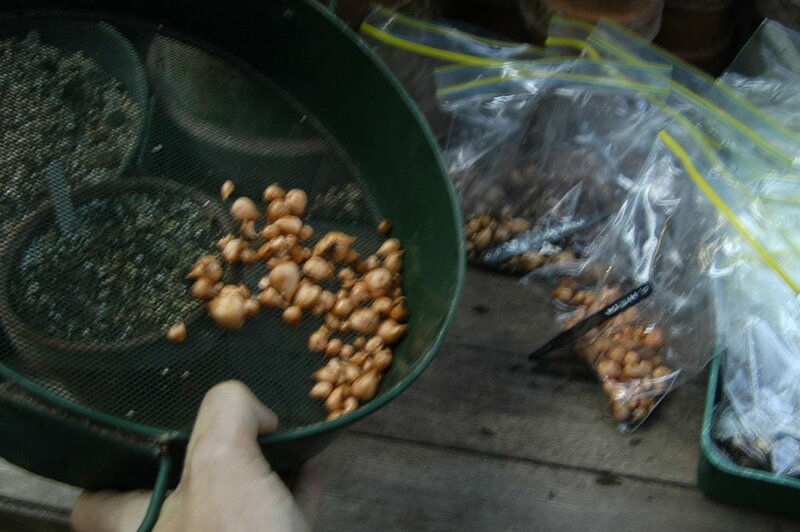 Be sure to selct a sieve with holes large enough to catch bulbs. Bulb size and shape differs greatly with species. I dump the entire pot into the sieve and then depending on the species, wither remove bulbs as I see them since many migrate to the bottom of the pot and are easier to remove before crushing the root ball, or with less robust species, carefully breaking the rootball to see if bulbs have divided at all. 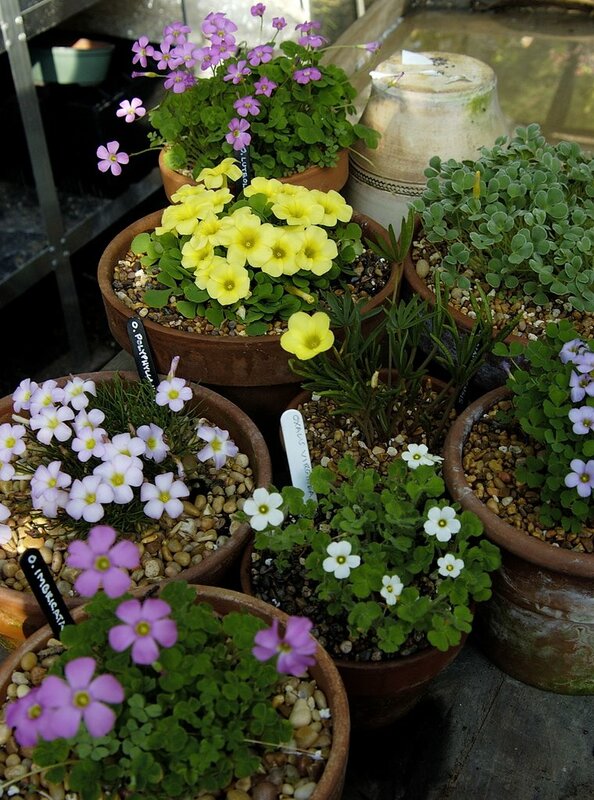 Many Oxalis speces send bulblets down into the ground deep, so they line up against the bottom of the pot. One theory is that these bulbs remain dormant for years. Mother Natures back up system perhaps, in case a population burns or gets eaten by baboons I am guessing. 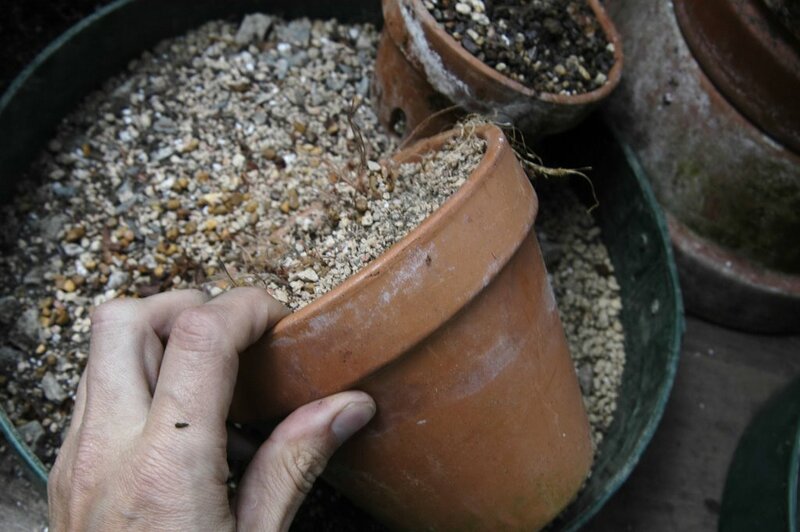 Removing these bulbs allows you to grow your collection, which is a good thing since on a whole, thes are not innexpensive bulbs since they sell for about $3.00 - $4.00 each and one must pot at least a dozen or more to get a nice display. 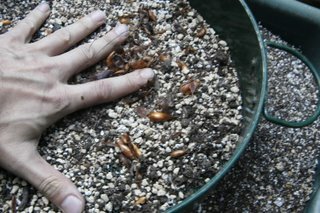 You will want to propagate them this way since they do not produce viable seed. Carefully pick out the bulbs, which is sometimes easy and at other times a challenge since some bulbs look exactly like rocks. This is also the fun part since you can see if you either lost a collection or grew is. Some species multiply well, while others remain about the same. It's a bit like digging for potatoes. 4. Store dry until repotting in early August. Since I am repotting a day or two later, I am using platic zip-lock bags which I keep open, I would not suggest this, they we're just handy. Some may want to catalog or keep a spread sheet on bulb count, and I have done this for some species but not yet for Oxalis, I just don't have the time, but memory does tell me that some species that I ordered from Telos last year have multiplied well. I usually order 6 bulbs and all of last years pots have grown to about 30 bulbs, of various sizes. 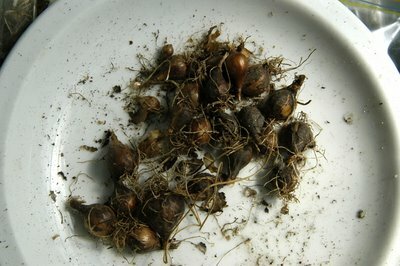 I save even the tiniest ones, so blooming size bulbs surely are at a minimum. I think I will repot some smaller bulbs in propagation pans so that they will have mroe room to grow and pick out the larger bulbs for show pots. Watering for all of these dormant bulbs will commence with the first arctic cold front sometime in early September. The theory here is that not only do the fall rains trigger growing but also the temperature shift. I have watered as early as Labor Day, around Sept 1, and as late as Oct. 1. Summer repotting will continue, starting here with Oxalis since they seem to send hair-like roots first, then Cyclamen species which have a very brief dormancy if at all. I then continue with the Narcissus, the followed by the balance of the minor South African bulbs with the ultilate goal of everything repotted dry and resting on the benches by the second week in August. The Amaryllids like my collection of Nerine sarniensis are not repotted per say, just top dressed since thier roots do not go dormant, and the bulbs are, in fact, actually growing a bit during thier summer break of foliage. These also are getting an occaisional spritz of water. 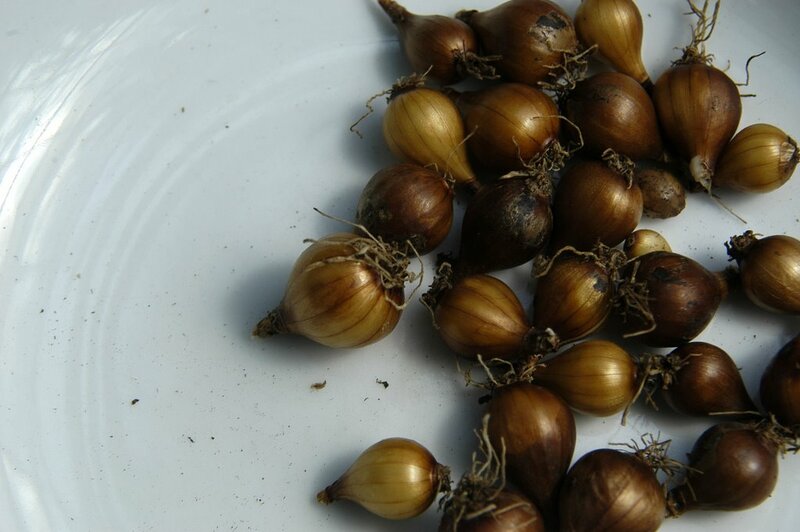 Summer dormant Bulbs can only be shipped in August, so order now for winter bloom. This is also the time to order bulbs that will bloom in the winter. If you have a cool greenhouse that remains frost free and cold, or anyplace that is bright, sunny and frost free, the winter growing bulbs from South Africa are some of the best performers and relatively easy once you master the cycle of winter wet and summer dry. For me, in the North East, this is easy with a glass greenhouse that is kept at 45 deg. F in the winter and allowed to get hot in the summer.